It is a double-edged sword. As global warming causes marine species to dwindle, the awareness raised by conservationists leads to an increase in tourists willing to travel long distances to the most remote corners of the world on luxury cruises to explore little-inhabited islands. One of the places that has seen a rise in such tours for snorklers and divers, usually called liveaboards, is Raja Ampat. Known for having the most diverse marine habitat on earth, Raja Ampat is home to 75% of the earth’s known coral species and an estimated 1,400 fish species. As such, industry experts reckon that the number of new liveaboards plying these waters has increased by at least 10% since last year, a figure that they believe will continue to grow. Friends who have been returning to Raja Ampat for the past six years tell me that when once they used to have the only boat in a cove or a dive site, they now have to share most sites with at least one other boat, and sometimes find divers destroying fragile coral life with poor dive techniques. I decided to tarry no further and bring forward this trip, which had been parked further down my bucket list simply because of the tedium of getting there. From Bali it is a 10-hour journey by air, including layovers in Sorong, the nearest port to Raja Ampat. Jakarta is an option too, but given the long trip the visitors, who are mostly European and American, usually prefer to stop at Bali before and after the cruise. Raja Ampat is a 40,000 sq km fragmented cluster of hundreds of little pockets of sand or dots of limestone cliffs and four main islands, nicknamed the Four Kings, in Bahasa Indonesia, to the northwest of New Guinea. Therefore, the most practical way to see it is on liveaboards. I chose the Dewi Nusantara, which translates from Bahasa as goddess of the archipelago. Though currently in her eighth year, the three-masted schooner owned and built by Dutchman Guido Brink, who is well-known in the region for building liveaboards of the highest safety standards, still enjoys an unrivalled reputation for her crew’s sterling service and luxurious fittings. Subject to vigorous checks and refurbishments every year, the boat clad in ironwood from the deep forests of Kalimantan still cuts a commanding presence at sea. 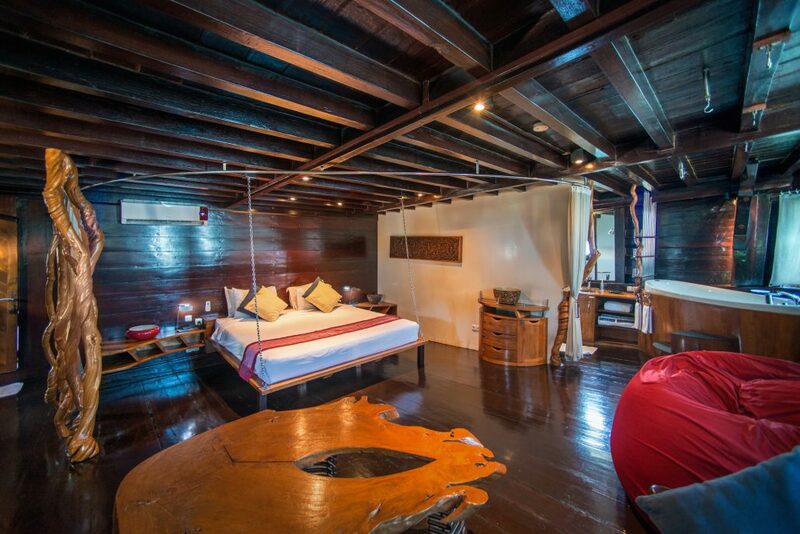 While its predominantly black exterior bears the elegant appeal of a 19th century pinisi, its interior is contemporary and equipped with 21st century mod cons. All eight air-conditioned staterooms are individually designed by Bruno Helgen, a French designer. Each cabin is spacious with an en-suite bathroom, reading lights, desk, chair and more power points and clothing storage than you’d need for an 11-day trip. There is a dedicated camera room on board for those who take underwater photography seriously, where you can dry cameras and twiddle with them at the end of the each day. The jewel in the crown is the Master Suite on the main deck – a 48 sq m room with a jacuzzi that runs along the full width of the ship and offers a 180 degree view of the ocean behind the ship from the stern. Some of the guests, including myself, were lucky to be given a view of the room when the Australian couple staying there allowed us to take a peek. Wendy Brown, Dewi’s British cruise director, is the only woman in the crew and she runs a tight ship. Everything ran like clockwork and her knowledge of the waters is encyclopaedic. Bookended by the Pacific and Indian oceans, much of of Raja Ampat’s marine life was discovered by an English explorer in the 19th century, Alfred Russel Wallace, who identified and named hundreds of species of flora and fauna in the islands. Today, Raja Ampat is the holy grail for divers, nature lovers, or simply those who wish to retreat from modern life. The confluence of oceans has resulted in an extremely rich food chain that ranges from microscopic organisms like Sarasvati shrimps to giant hawksbill turtles and giant manta rays with a 5m-wide wing span. None of the three daily day dive sites or single evening dive disappointed. We saw at least six wobbegong sharks and a few Raja Ampat walking sharks amongst other marine life. Being caught in a vortex of silversides while schools of snappers and barracudas weaved in and out was common and made for many National Geographic-worthy camera moments. Many of the islands are limestone cliffs with stalactites below them. Over thousands of years, wave erosion has cut the cliffs from below the sea level so these little islands look like mushrooms – giving rise to the name Mushroom Islands at one site. Toberlone Tunnel, a cave illuminated by shafts of light penetrating the water surface and bouncing off the walls, entranced all of us in its beauty. At the end of each dive, we would be treated to a complementary neck and shoulder massage. There is an option to pay for a full 60-minute massage every sunset. Diving is not the only activity on the Dewi Nusantara. Some of these islands have a tiny strip of beach, lagoons in which you could just float or inlets to kayak. And not every trip is the same – it depends on the overall interests of the group. During my trip, all the guests were divers, though not all of us dived on every occasion. Some snorkeled and kayaked while getting over their jetlag the first few days. Guests on private charters will also usually visit some of the inhabited islands to experience local culture. On our second-last day, we hiked up an island that had a platform for us to enjoy a bird’s eye view of a cluster of islands called Wayag Island. Beautiful panoramas aside, it’s really the crew that distinguishes Dewi Nusantara. There’s Hendrick, the front of house manager who never says no to any special requests for meals. Steven and Andre, two of the five divemasters on Dewi, are able to spot the tiniest of sea creatures like pgymy seahorses. Brown called the chef a magician, which was a befitting analogy as he kept us well fed throughout our trip. He’s both the baker and cook, turning out a pillowy orange turnover cake that was moist and fragrant while dripping with a citrusy sauce – exactly what we wanted to sink our cold fingers into after a dive – and whipping up a crisp vegetable salad that was no less fresh-looking at day 10 than day one, accompanied by a juicy fillet mignon at dinner. His pannacotta with a blueberry compote and smoky vanilla flavour beats, hands down, any others I have tasted. You will certainly not be left with cravings of the food back home. By Mavis Teo[:zh]It is a double-edged sword. As global warming causes marine species to dwindle, the awareness raised by conservationists leads to an increase in tourists willing to travel long distances to the most remote corners of the world on luxury cruises to explore little-inhabited islands. One of the places that has seen a rise in such tours for snorklers and divers, usually called liveaboards, is Raja Ampat. Known for having the most diverse marine habitat on earth, Raja Ampat is home to 75% of the earth’s known coral species and an estimated 1,400 fish species. As such, industry experts reckon that the number of new liveaboards plying these waters has increased by at least 10% since last year, a figure that they believe will continue to grow. Friends who have been returning to Raja Ampat for the past six years tell me that when once they used to have the only boat in a cove or a dive site, they now have to share most sites with at least one other boat, and sometimes find divers destroying fragile coral life with poor dive techniques. I decided to tarry no further and bring forward this trip, which had been parked further down my bucket list simply because of the tedium of getting there. From Bali it is a 10-hour journey by air, including layovers in Sorong, the nearest port to Raja Ampat. Jakarta is an option too, but given the long trip the visitors, who are mostly European and American, usually prefer to stop at Bali before and after the cruise. 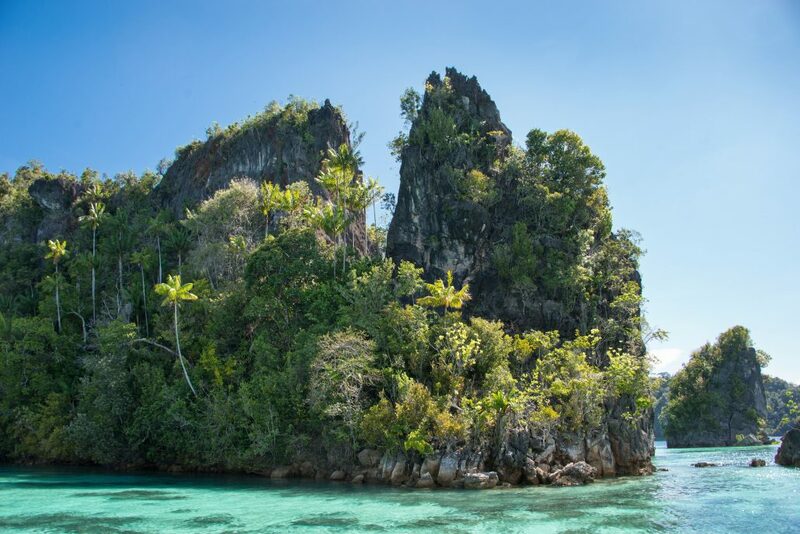 Raja Ampat is a 40,000 sq km fragmented cluster of hundreds of little pockets of sand or dots of limestone cliffs and four main islands, nicknamed the Four Kings, in Bahasa Indonesia, to the northwest of New Guinea. Therefore, the most practical way to see it is on liveaboards. I chose the Dewi Nusantara, which translates from Bahasa as goddess of the archipelago. Though currently in her eighth year, the three-masted schooner owned and built by Dutchman Guido Brink, who is well-known in the region for building liveaboards of the highest safety standards, still enjoys an unrivalled reputation for her crew’s sterling service and luxurious fittings. 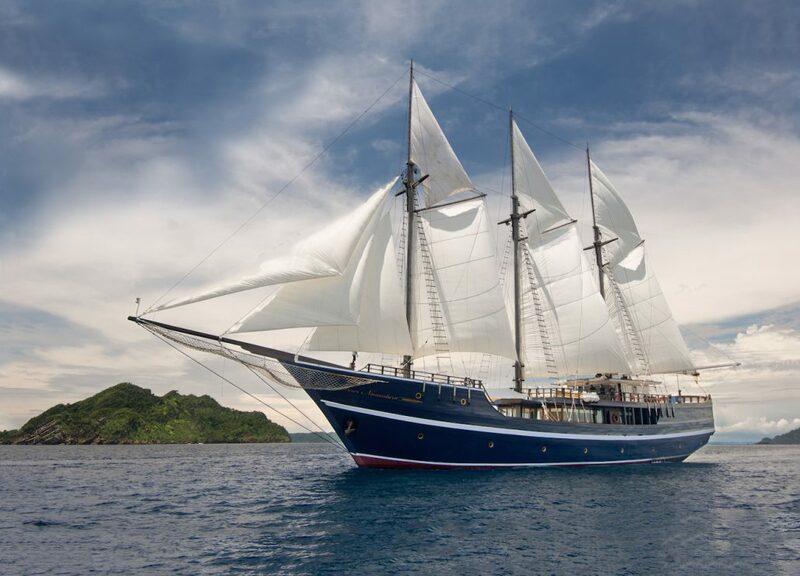 Subject to vigorous checks and refurbishments every year, the boat clad in ironwood from the deep forests of Kalimantan still cuts a commanding presence at sea. While its predominantly black exterior bears the elegant appeal of a 19th century pinisi, its interior is contemporary and equipped with 21st century mod cons. All eight air-conditioned staterooms are individually designed by Bruno Helgen, a French designer. Each cabin is spacious with an en-suite bathroom, reading lights, desk, chair and more power points and clothing storage than you’d need for an 11-day trip. There is a dedicated camera room on board for those who take underwater photography seriously, where you can dry cameras and twiddle with them at the end of the each day. The jewel in the crown is the Master Suite on the main deck – a 48 sq m room with a jacuzzi that runs along the full width of the ship and offers a 180 degree view of the ocean behind the ship from the stern. Some of the guests, including myself, were lucky to be given a view of the room when the Australian couple staying there allowed us to take a peek. Wendy Brown, Dewi’s British cruise director, is the only woman in the crew and she runs a tight ship. Everything ran like clockwork and her knowledge of the waters is encyclopaedic. Bookended by the Pacific and Indian oceans, much of of Raja Ampat’s marine life was discovered by an English explorer in the 19th century, Alfred Russel Wallace, who identified and named hundreds of species of flora and fauna in the islands. Today, Raja Ampat is the holy grail for divers, nature lovers, or simply those who wish to retreat from modern life. 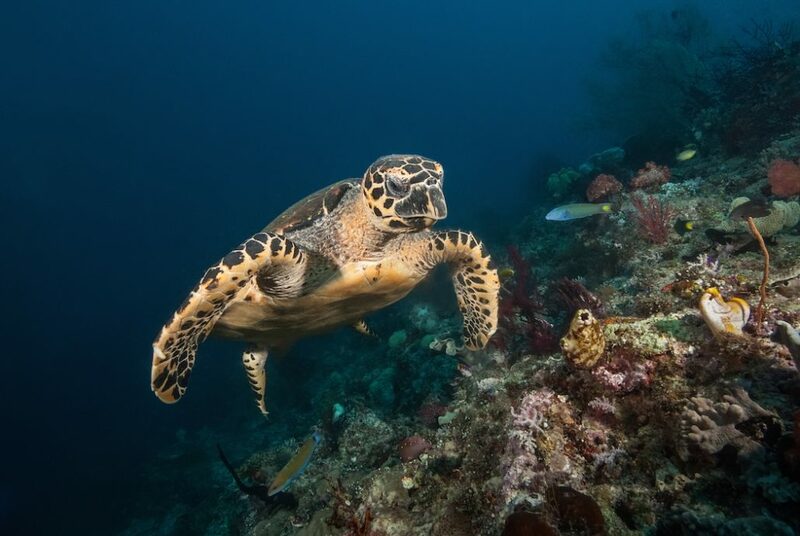 The confluence of oceans has resulted in an extremely rich food chain that ranges from microscopic organisms like Sarasvati shrimps to giant hawksbill turtles and giant manta rays with a 5m-wide wing span. None of the three daily day dive sites or single evening dive disappointed. We saw at least six wobbegong sharks and a few Raja Ampat walking sharks amongst other marine life. Being caught in a vortex of silversides while schools of snappers and barracudas weaved in and out was common and made for many National Geographic-worthy camera moments. Many of the islands are limestone cliffs with stalactites below them. Over thousands of years, wave erosion has cut the cliffs from below the sea level so these little islands look like mushrooms – giving rise to the name Mushroom Islands at one site. Toberlone Tunnel, a cave illuminated by shafts of light penetrating the water surface and bouncing off the walls, entranced all of us in its beauty. At the end of each dive, we would be treated to a complementary neck and shoulder massage. There is an option to pay for a full 60-minute massage every sunset. Diving is not the only activity on the Dewi Nusantara. Some of these islands have a tiny strip of beach, lagoons in which you could just float or inlets to kayak. And not every trip is the same – it depends on the overall interests of the group. During my trip, all the guests were divers, though not all of us dived on every occasion. Some snorkeled and kayaked while getting over their jetlag the first few days. Guests on private charters will also usually visit some of the inhabited islands to experience local culture. On our second-last day, we hiked up an island that had a platform for us to enjoy a bird’s eye view of a cluster of islands called Wayag Island. Beautiful panoramas aside, it’s really the crew that distinguishes Dewi Nusantara. There’s Hendrick, the front of house manager who never says no to any special requests for meals. Steven and Andre, two of the five divemasters on Dewi, are able to spot the tiniest of sea creatures like pgymy seahorses. Getting to Raja Ampat was admittedly arduous, yet once there I was reminded that there are still many places to be explored; places untouched and breathtakingly beautiful. Such places have stayed pristine for so long because they are hard to get to. With more people making their way there, one can only guess at how long these islands will remain the way they are. I am glad I made my trip in time. dewi-nusantara.com[:nl]It is a double-edged sword. As global warming causes marine species to dwindle, the awareness raised by conservationists leads to an increase in tourists willing to travel long distances to the most remote corners of the world on luxury cruises to explore little-inhabited islands. One of the places that has seen a rise in such tours for snorklers and divers, usually called liveaboards, is Raja Ampat. dewi-nusantara.com[:de]It is a double-edged sword. As global warming causes marine species to dwindle, the awareness raised by conservationists leads to an increase in tourists willing to travel long distances to the most remote corners of the world on luxury cruises to explore little-inhabited islands. One of the places that has seen a rise in such tours for snorklers and divers, usually called liveaboards, is Raja Ampat.